An activist was 'assaulted' on Thursday while protesting in front of the Great Siege Monument in Valletta, the groups Repubblika and Occupy Justice said. They said in separate statements that while activists were protesting peacefully by placing flowers and candles at the foot of the monument, they were threatened by a group of people who gathered in front of the monument. At one point, two of them assaulted one of the protesters, the protester's mobile fell and the attackers slammed it to the ground, breaking it in the process. A report was filed at the Valletta police station. Repubblika condemned the act of violence and said that attacks on peaceful protesters seemed to have become the norm and aimed to intimidate. 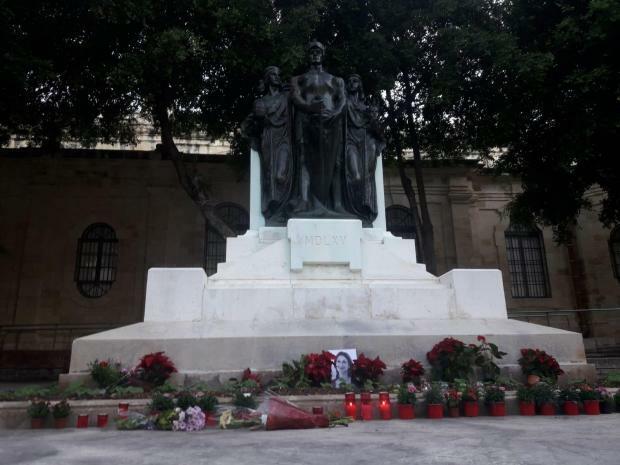 As had been declared by the police more than once, Repubblika said, the ongoing protest in front of the Great Siege Monument calling for justice with slain journalist Daphne Caruana Galizia was in line with the law. One’s right to protest should not be actively strangled by the government. Freedom of expression meant that the government had the duty to protect those who protested according to law. If the government did not protect this right, it would be trampling on the right to freedom of expression. Repubblika said it could not understand how flowers and candles were considered an act of provocation while beatings, name calling and physical intimidation were justified. The police, it said, could not remain neutral and had the duty to protect one's right to protest. Occupy Justice said intimidation, encouraged by the Prime Minister, had become a daily occurrence. 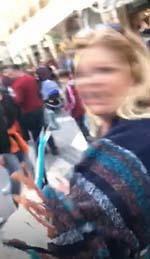 Footage shot by one of the protesters showed a woman swearing and then lashing out. "When candles instigate violent reactions from supporters of corruption, then the country’s democratic process has truly gone to the dogs. "Here’s news for you. We won’t be intimidated. We will persist until justice is served," the organisation said. In a statement, Partit Demokratiku leader Godfrey Farrugia said that being harassed and denigrated for voicing one’s opinion in a democratic country was "just not on". PD condemned those who, out of arrogance, insulted those who paid tribute to the late Daphne Caruana Galazia. Such incidents at Valletta, it said, were escalating with a second bullying attack on peaceful bystanders being witnessed within a week. The police, PD said, were duty bound to hold law and order. "We stand foursquare behind all those who are being harassed and denigrated for voicing their opinions," secretary general Martin Cauchi Inglott said. A democratically elected government should not allow such acts of intolerance towards any dissenters to happen, he said, adding that intolerance towards the differing opinions of others made a mockery of freedom of expression, opinion and freedom of association.